Kharbin in Manchuria was the largest Russian military rear base during and immediately after the Russo-Japanese War, with warehouses holding supplies of food and weapons, barracks housing soldiers, and hospitals for the wounded and dying. A Hospital Suburb [Gospital'ny Gorodok] was created in 1904 and by July of that year there were 12 Army hospitals and two Red Cross facilities. By January 1905, the number of hospitals had grown to 84 with a capacity to hold 30 000 patients. I take these figures from David Wolff's To The Harbin Station. In the context of such numbers, it is not surprising that a post office was opened in the Hospital Quarter just as one was in the Barracks or Camp Quarter [ Korpus'ny Gorodok ]. 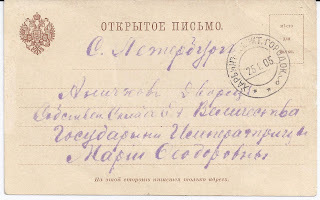 In 1959, Tchilingirian and Stephen in Stamps of the Russian Empire Used Abroad, Part Five recorded a cancellation from the Camp on the basis of a single example. But they did not record a cancel for the Hospital Quarter. I show an example below; the cancellation is identical in style to the Camp Quarter cancel and reads KHARBIN GOSPIT. GORODOK serial "b". The card is an Imperial Formular card, pre-addresed in hectography to the Maria Feodorovna charities in St Petersburg. What is puzzling is why this cancellation and the Camp cancellation should - apparently - be so rare. There were a very large number of people in Kharbin who would have wanted to write home at this time. Perhaps cards like this one are buried in dealer boxes, but after a hundred years that seems a bit unlikely - I did not find this in a dealer box and paid a three figure sum for it But maybe readers do have other examples of this cancel and the Camp cancel. I will happily show them here if sent scans. At the same time as I was writing the above piece, I was looking out Theatre Tax stamps from my stock. It occurs to me that I may have the answer to an old problem. There exists a Kharbin Theatre Tax stamp which is rarely seen .I show it below. I first saw an example maybe twenty years ago when I bought parts of Agathon Faberge's fiscal collection. I have seen two or three since and have the example below in stock. Now, the printing, the burelage, the paper and the gum looks like those I would associate with the State Printing Works in St Petersburg; it does not look like a local production. The 2 kopeck value seems too low for a World War One or Civil War period production. 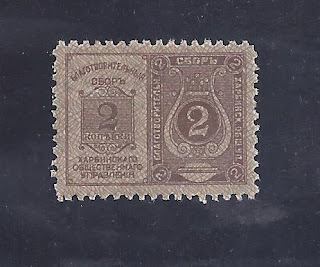 The obvious conclusion is that this stamp was issued at the time of the Russo-Japanese War in 1904 - 06 in response to the vast influx of troops and other personnel to Kharbin, some of whom would have sought out theatres or concert halls for entertainment. In effect, Kharbin was a boom town at this time. Though the inscription on the stamp refers only to charitable purposes, the style in two halves with repeated text is that of a Theatre Tax stamp, designed for tearing in half. Can any reader offer any confirmation or alternative suggestion? 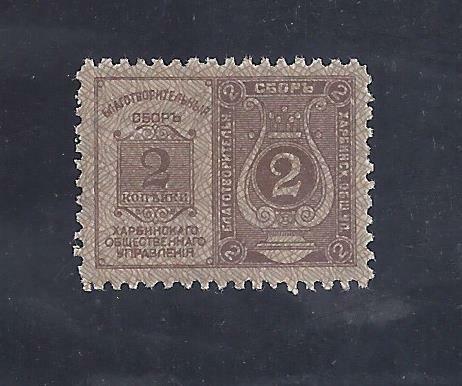 This stamp was issued by the Kharbin city council for a charitable donation of 2 kopecks. There is no mention of the donation's purpose, so I would hesitate to conclude that a theatre was involved.